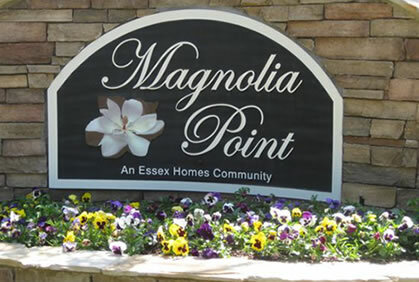 Welcome to the neighborly Essex Homes neighborhood of Magnolia Point, located in the Irmo, SC area. Homes in Magnolia Point are well appointed offering many amenities, including master suites with deluxe baths, and walk-in closets throughout. These all brick homes boast open floor plans and the added convenience of irrigation systems in the landscaped yards. Homes in Magnolia Point range in price from the upper $200,000's to the low $300,000's, and vary in size from 2600-3500 square feet. In this development you will find spacious homes offering one and two story floor plans of 3-5 bedrooms and 2 car garages. Magnolia Point has the benefit of many nearby conviences including the Lake Murray dam walk only 3 miles away, offering a paved pathway across the Lake Murray dam which is 3.2 miles one way, and an area on one side of the dam appointed with a public beach, and on the other side offering public fishing, boat ramp and picnic area, and public parking on both sides. This development is just off Lake Murray Boulevard and also nearby Interstate 26, and Columbiana Center Mall, as well as the Harbsion area offering nearly any convenience you are seeking for shopping, dining or recreation. This neighborhood is zoned for the excellent schools of Lexington Richland 5, including Irmo Elementary, Irmo Middle School, and Irmo High School. You will feel right at home in Magnolia Point.